Willow Grove Physical Therapy: What does core stabilization mean? What does core stabilization mean? Core stabilization is generally thought of as the low back (lumbar) muscles keeping the spine stable in the “functional zone” or “neutral zone”. This is where you may spend the majority of your time while doing normal activities throughout the day; whether it is walking, exercising, cleaning or gardening, etc. 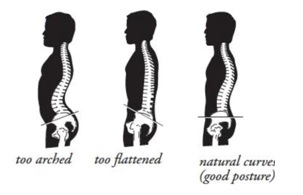 Here is a good depiction of good posture, which the muscles surrounding the spine are mostly responsible. You can consider the “neutral zone” in-between the too arched and too flattened pictures. Your spine can become too arched or flattened if these muscles are weak and this can lead to low back pain and poor posture. Studies have shown that the deep core muscles can actually atrophy or become smaller/weaker if you are experiencing chronic pain (greater than 6 months). So, what should you do each day to address your “core”? Sit-ups or flexing of the spine is what comes to many peoples’ minds, but the real answer is to address your deep core muscles which are responsible for spinal stability and not just the superficial muscles. Now, what are the three main systems of stability for the spine? Well, the deep core muscles are responsible for stability in the “neutral zone”, and then your nerves also contribute as they stimulate the muscles. Finally, the bones/ligaments/disks provide passive support at end ranges. Studies have shown that the lumbar spine would buckle with just 20 pounds of force if it were not for the muscles surrounding the spine, which shows their importance and need for training! The transverse abdominis is one of the most important as this muscle can relieve stress from the spine and is done simply by drawing in your belly button toward your spine, while in the “neutral position”. This is a good position to begin this exercise, and then there are ways that you can progress this so that it is more challenging and functional. The multifidi muscles are smaller muscles between your spinal segments that provide compressive control and are vital for lumbar instability issues. This is a much more challenging exercise that activates your multifidi muscles and you can notice the “neutral position” of the spine and pelvis. There are many more important core-stabilizing muscles in the abdomen, back and surrounding the hips. The physical therapists here at Willow Grove Hatboro PT are highly trained at identifying where these weaknesses may be occurring in the body and can develop appropriate interventions and exercise programs to help alleviate low back pain so you can return to your everyday hobbies. It is important to develop appropriate programs to address flexibility, strength, mobility to prevent these injuries from returning. If you or someone you know is struggling with back pain let us know! We will thoroughly evaluate their spine and core muscle strength and devise a plan to get them on the road to recovery!